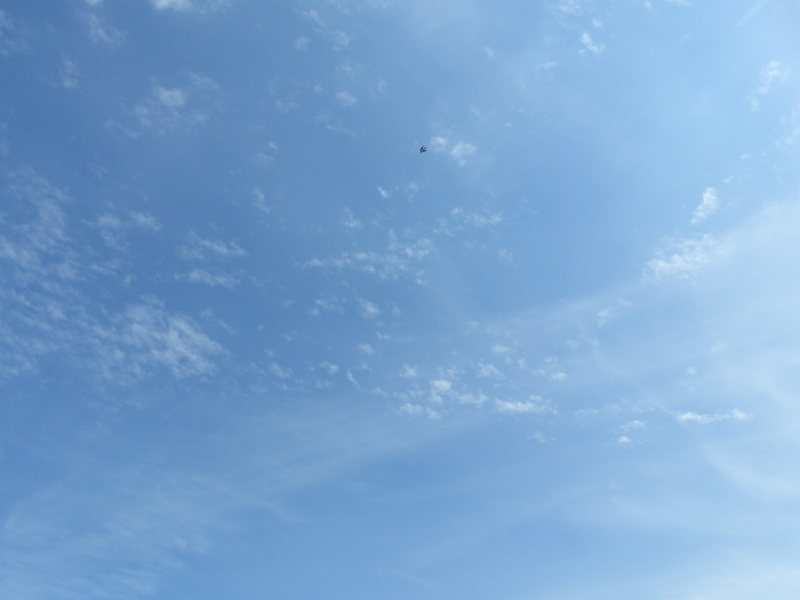 There is not an awful lot to report today. 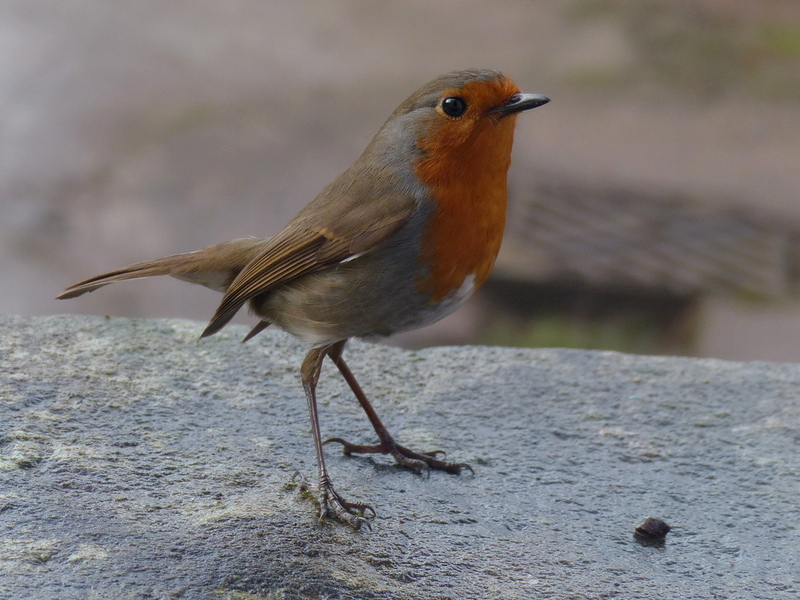 We have had new visitors to the garden. This is a mixed pair of Bullfinches (Pyrrhula pyrrhula). 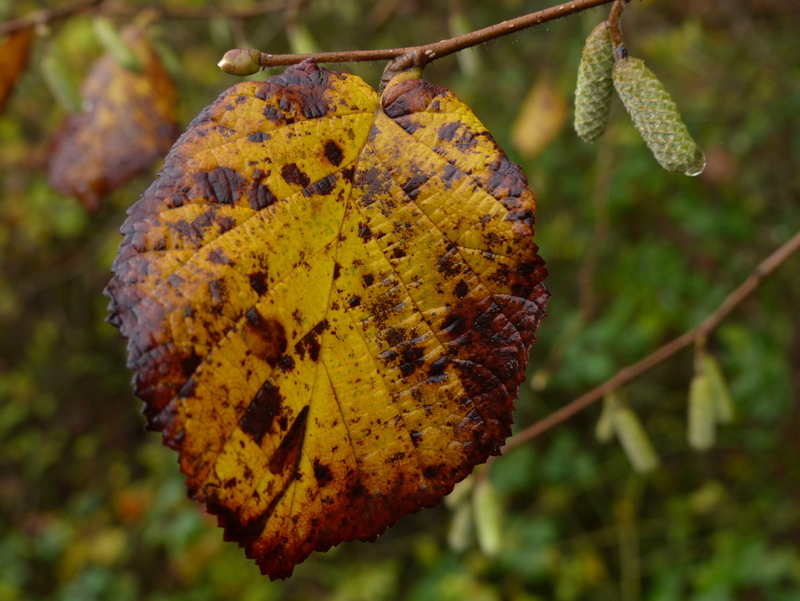 Apologies for the quality of the pictures but the weather was awful, I offer these as a record of species. 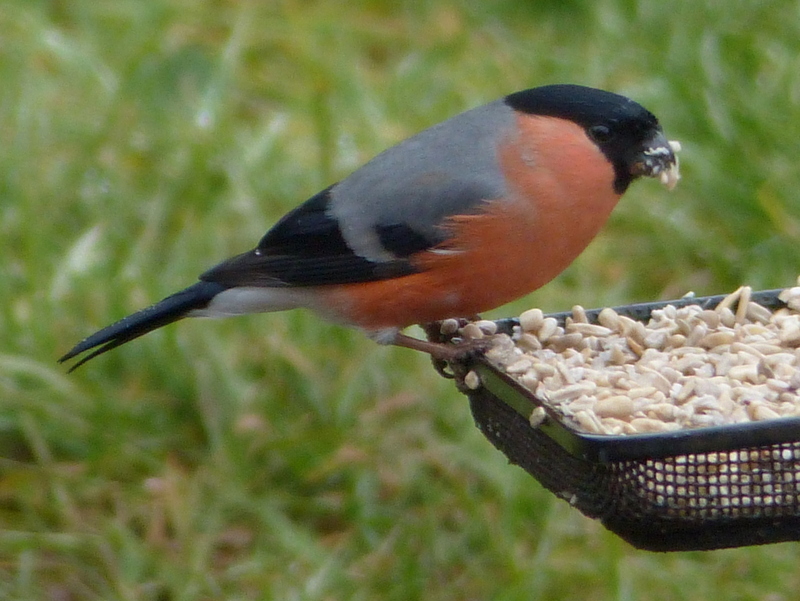 It has been about a year since I saw a Bullfinch in the garden, then it was just one male and he didn’t stay. These have been around for about a week now and obviously I hope that they do stay. 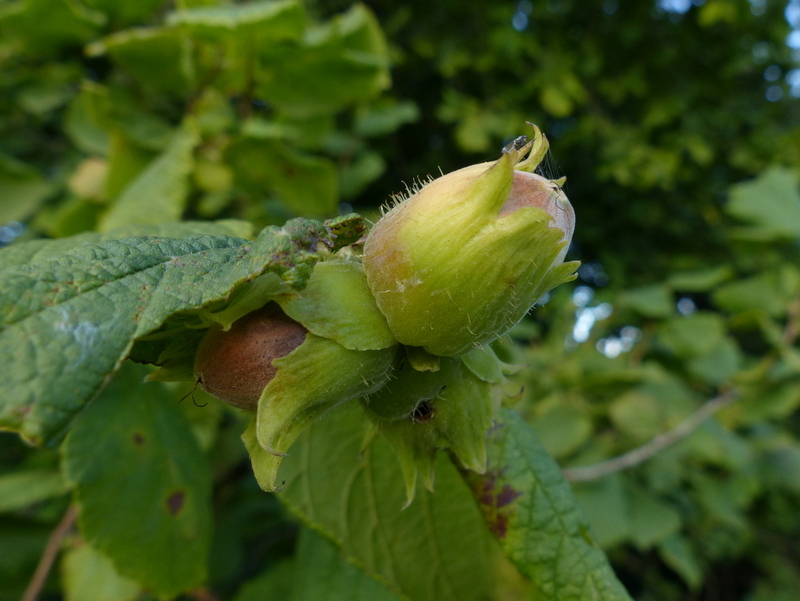 Bullfinches are very fond of buds, especially of fruit trees and we have an apple orchard at the bottom of the garden, so hey, what’s the problem? At the moment they are digging into the sunflower hearts and the seeds are sticking to their faces, I don’t know if it was just because it was raining when I took these pictures but they look like babies plastered with food. I hope that they nest here. Now I am a famous Botanist, Entomologist and Big Game Hunter (Heck, I am probably even an Astronaut, I haven’t checked) but despite all of my qualifications, most people still come here to see Scruffbag. So here is Scruffbag in the weather. It has been very up and down, that’s all I’m saying. BTW. This post is called “The End of Scruffbag” because tomorrow my valued associate is going to the beauty parlour to get fixed, after today you won’t recognise her. So Fizz is planning a post on FB saying that I only love animals that eat worms. That is not really true, there is plenty of room for one more animal in my life and soon there will be three of us writing this blog and that will be better than two. 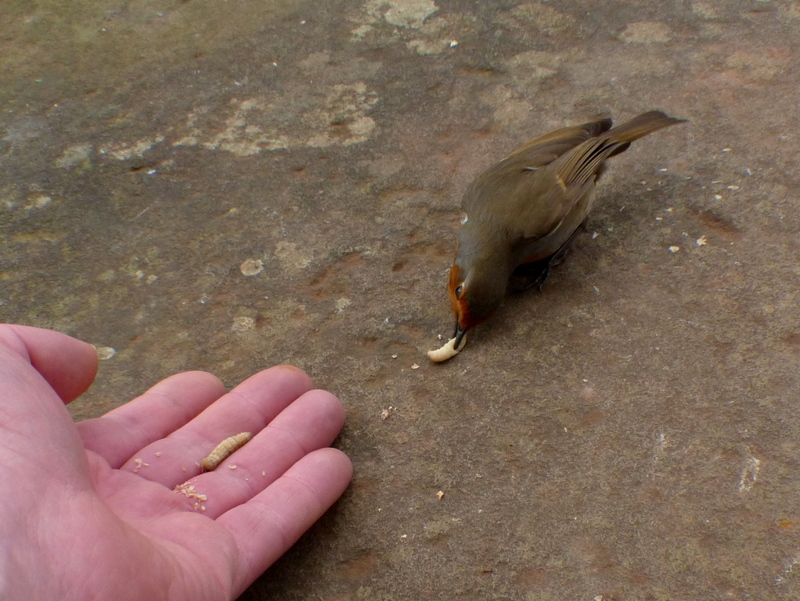 We spent a lot of time playing “how close will you get?” Then yesterday the bird started eating out of my hand but.. It is not perching on my hand yet. I have to put my hand on the floor. This is just awkward because it involves a lot of me being on the floor and it is uncomfortable but we are getting there. Wildflowers next and after a very slow start things are picking up. 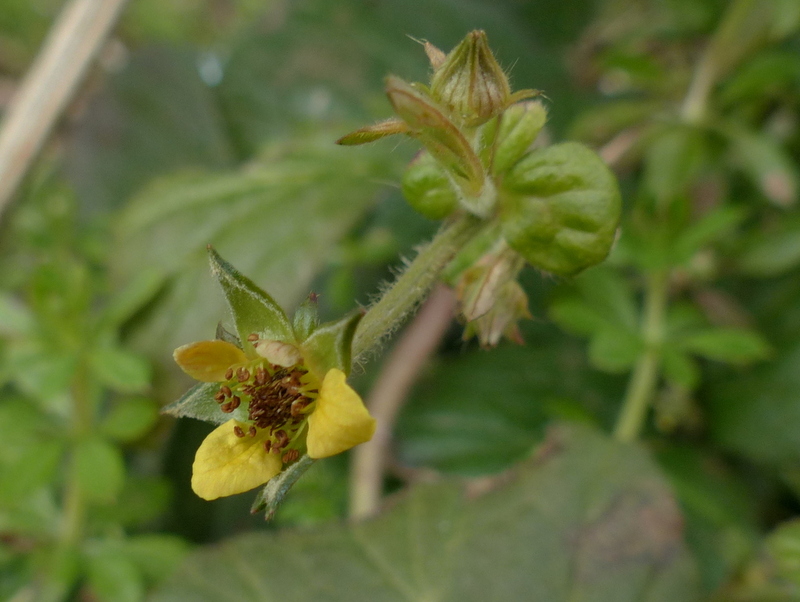 On Sunday I found my first Wood Avens, I would say, out of season, but I did find a few early flowers last year. 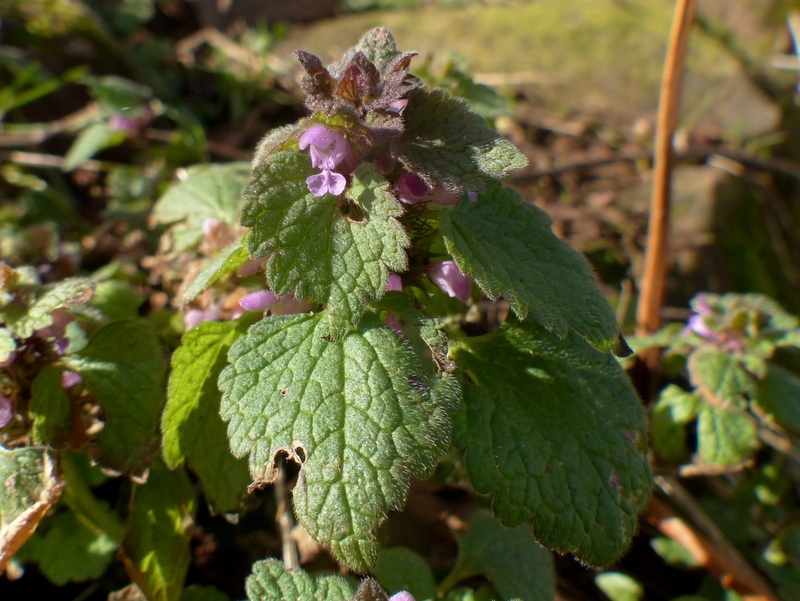 Tuesday brought Red Dead-nettle and about time too, this one is two weeks late.. 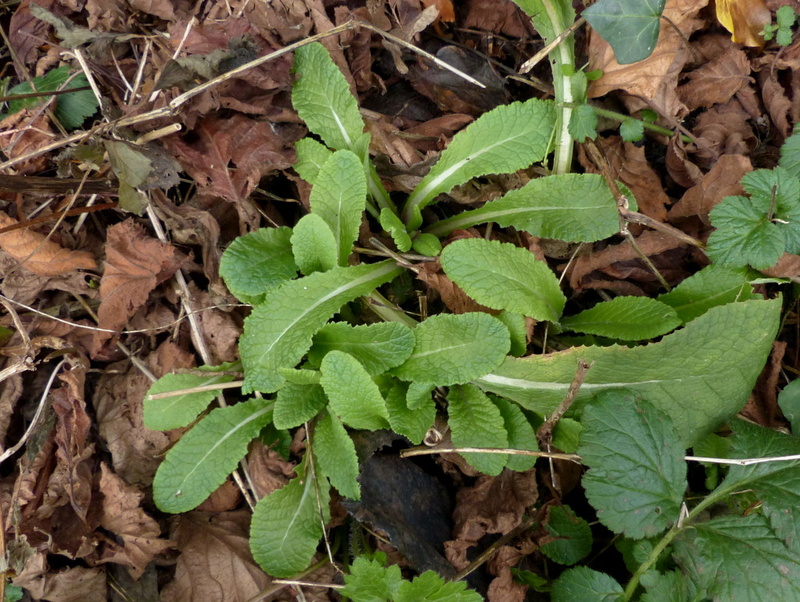 There are still no Primroses though but please don’t write in on this subject. In the garden we have got yellow ones, red ones, we have even got a blue one and have had since the beginning of January. I am just not finding them in the wild. My area is at a bit of altitude and a good two weeks behind sea level so you may well have wild primroses around you, plus they will come out in the open before they come out in the woods but I was photographing them here on February the third last year. Okay, say goodbye to Scruffbag. and for those who really can’t get enough of her, here is a video. You are only going to want to watch this if like me you are a student of animal behaviour or if you like big eyes. 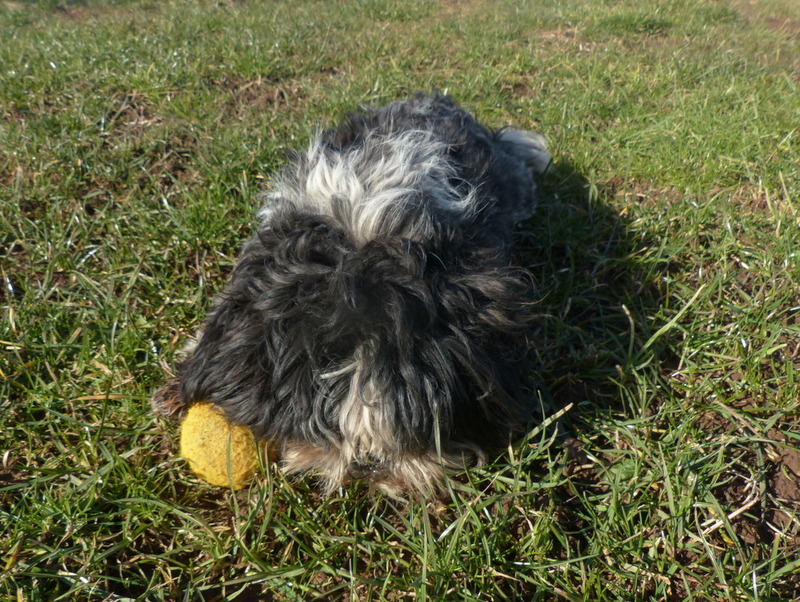 She is keeping the ball from me but she doesn’t just run off with it, she walks a few paces and waits for me to catch up and as I bend down she takes another few steps out of reach and waits for me again. So I wrote about Hazel. 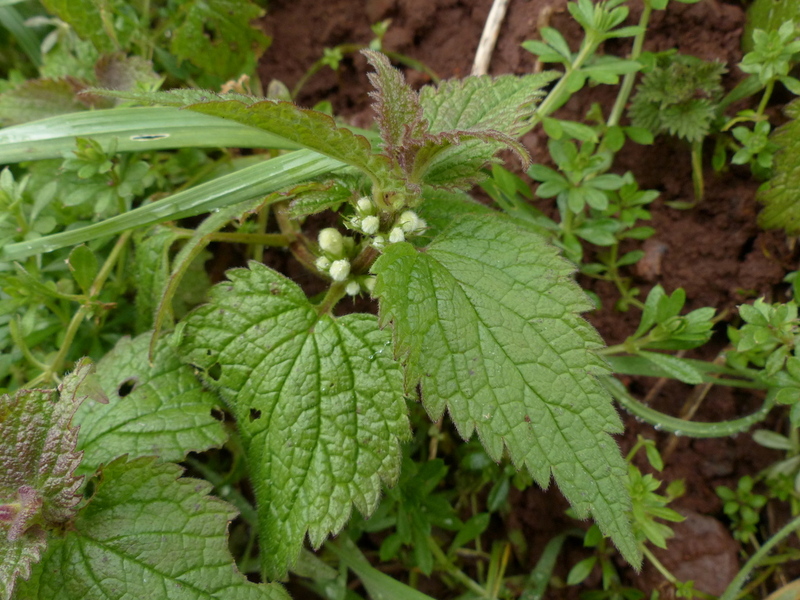 In February I am having trouble keeping up with the wild flowers as they appear, White Dead-nettle isn’t on Easy Wildflowers yet. It is pretty obvious that I will fall behind in the summer. Oh well, I will just do my best. 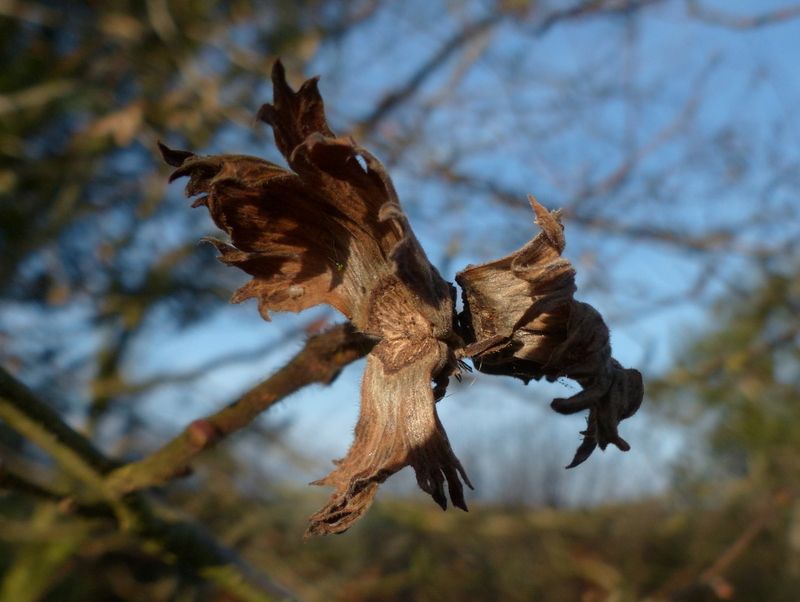 I left a lot out of this post, there are no leaves or bark, I am not even sure that I mentioned that Hazel is a tree. It is one that I will come back to. 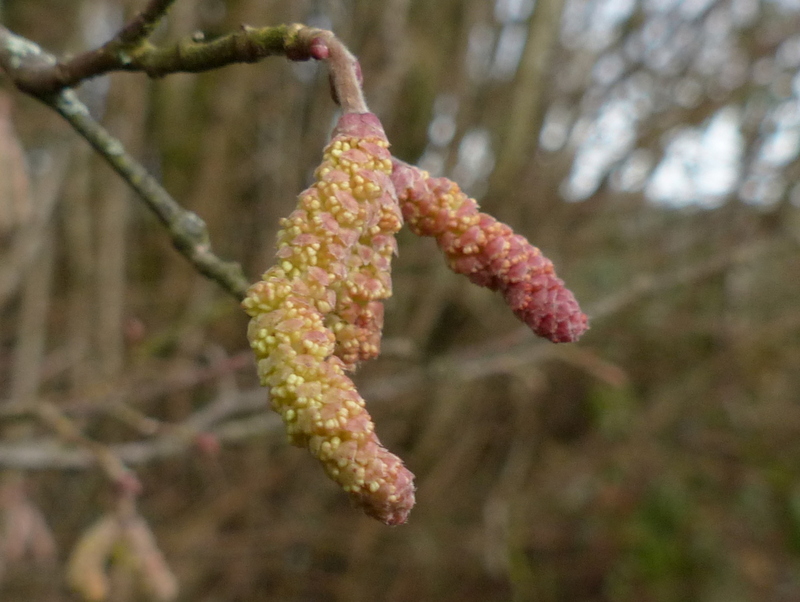 Hazel catkins are an inflorescence of small flowers that form in the autumn and are with us all winter, they can begin to open in January if the weather is mild. 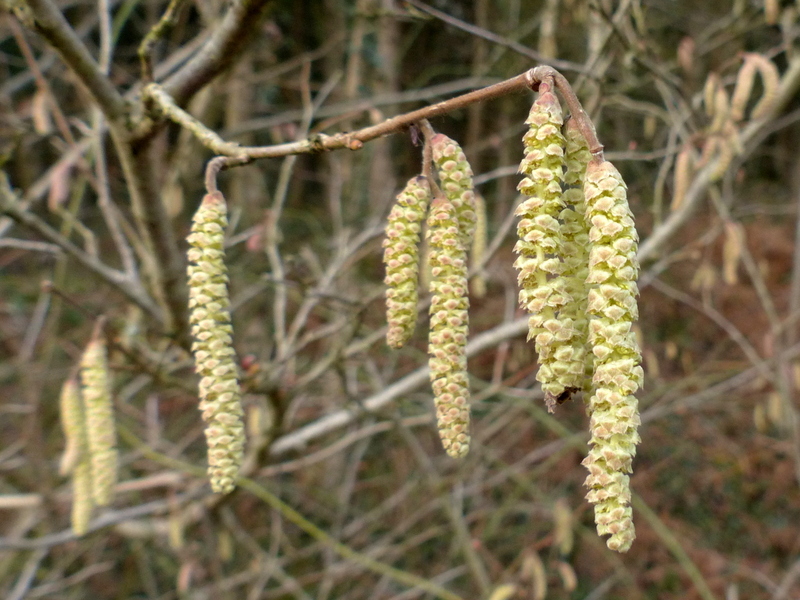 Each catkin is a flower head, comprised of about 240 small flowers. 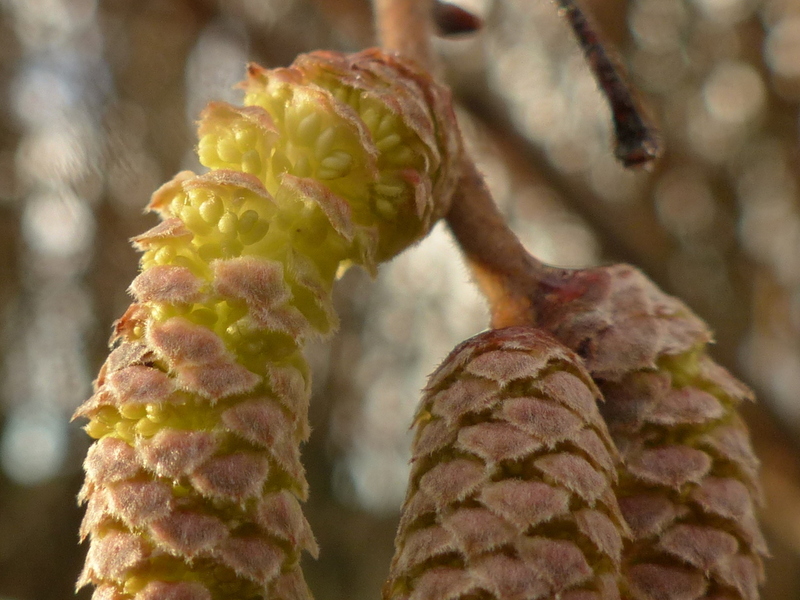 Each flower is covered by a triangular downy bract, beneath the bract are four stamens and each stamen has two yellow anthers (the pollen producing male part of a flower). 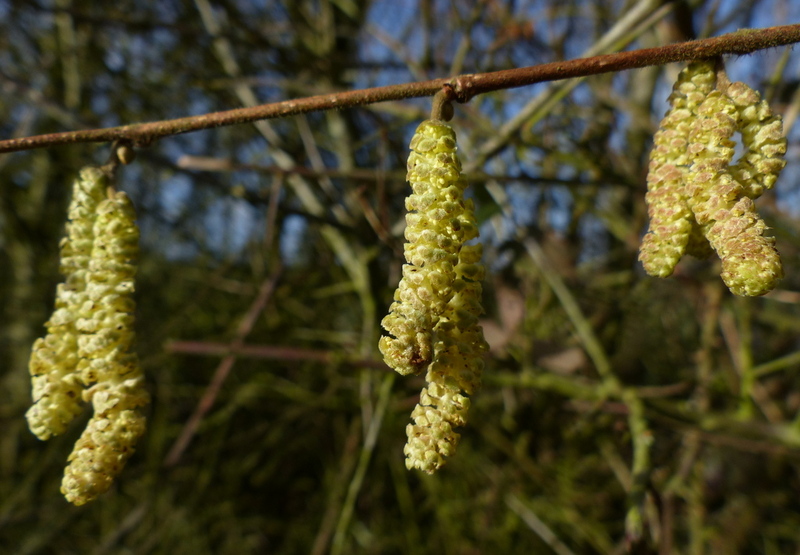 A single anther will produce around nine thousand grains of pollen and one catkin, nearly nine million. 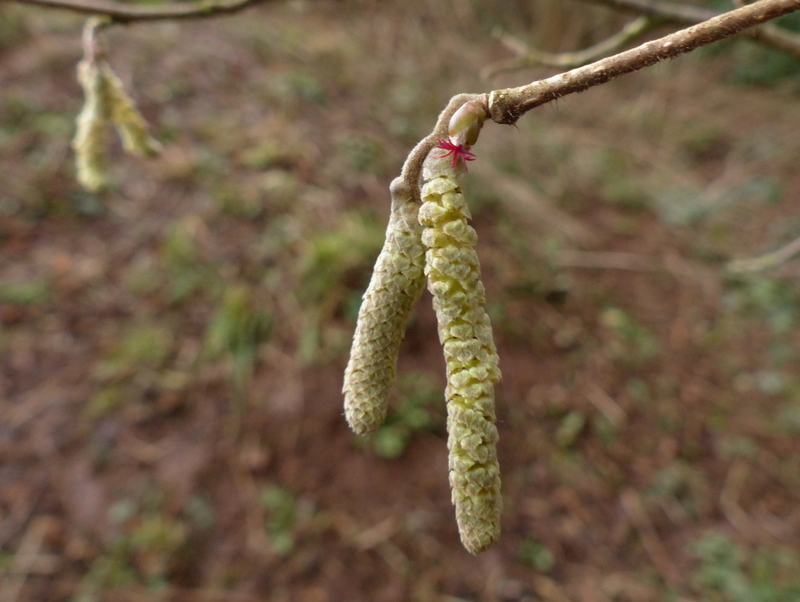 A Hazel tree produces a lot of pollen. Hazel is wind-pollinated and not reliant on insects so most of the pollen produced is blown away and doesn’t find it’s target. 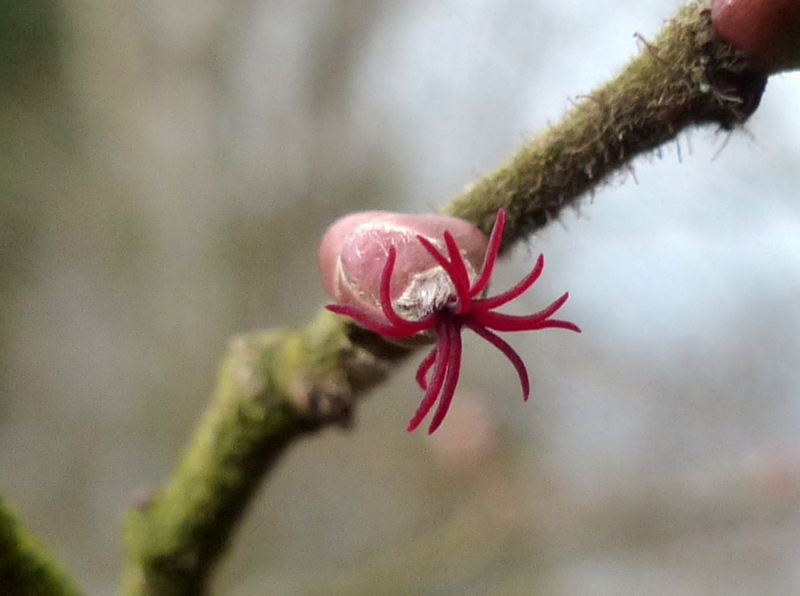 The target for the pollen is the style of the female flower. 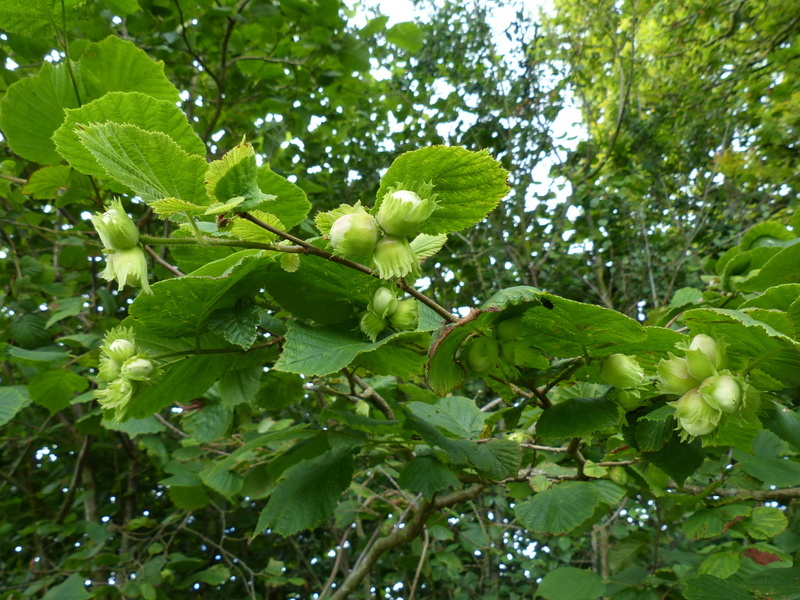 The Hazel tree is monoecious, meaning that each tree has both male and female flowers. 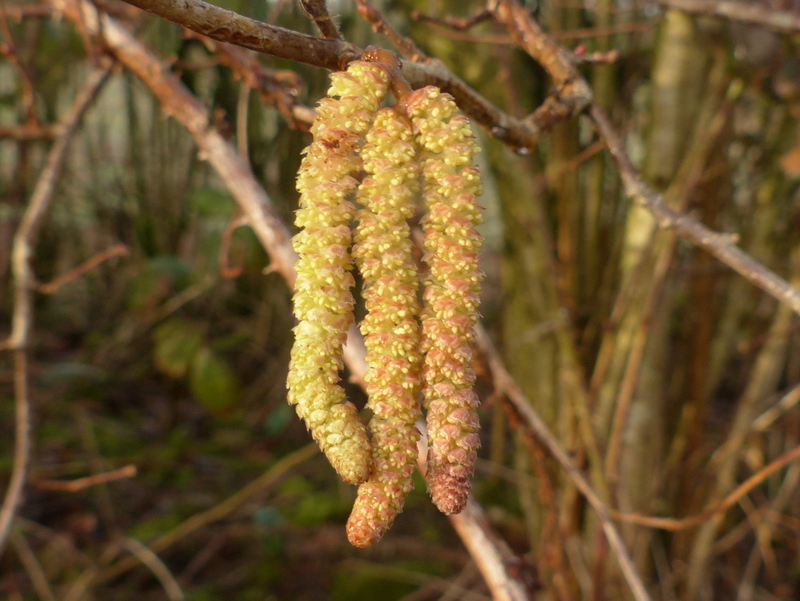 The female flowers grow in clusters from small buds above the catkins. 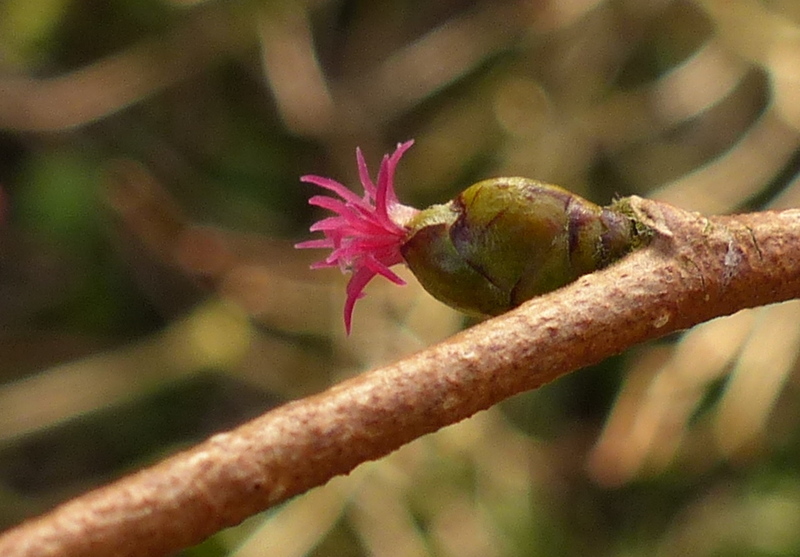 Only the red styles of the flowers protrude from the buds and the female inflorescence typically measures 2-4 mm across, It is a very small flower. 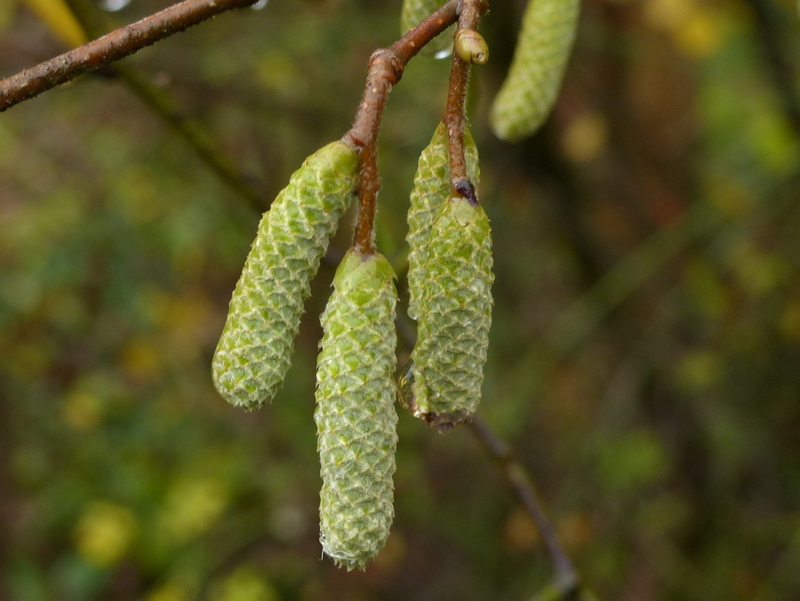 Despite anything that you may read to the contrary (or that I may have told you in the past) the location and timing of the female flowers has nothing to do with avoiding self pollination. 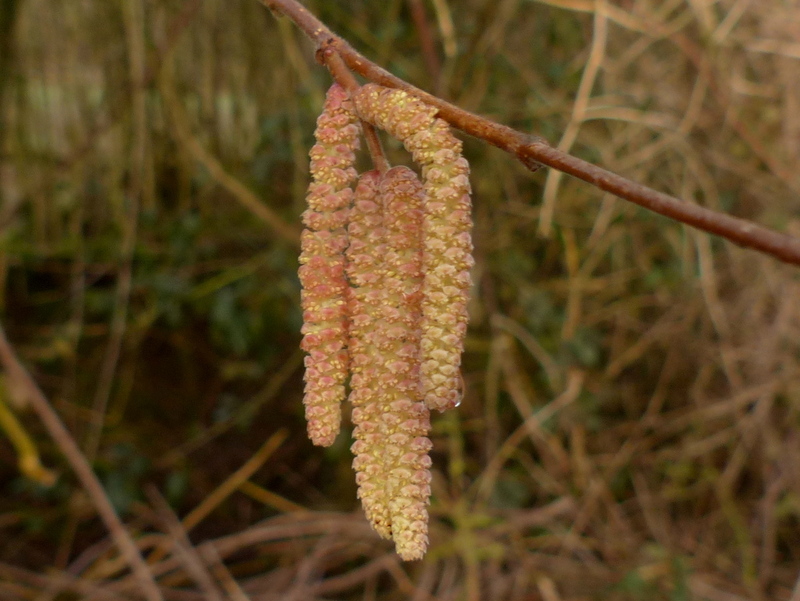 Corylus avellana is self incompatible, it cannot self-fertilise. 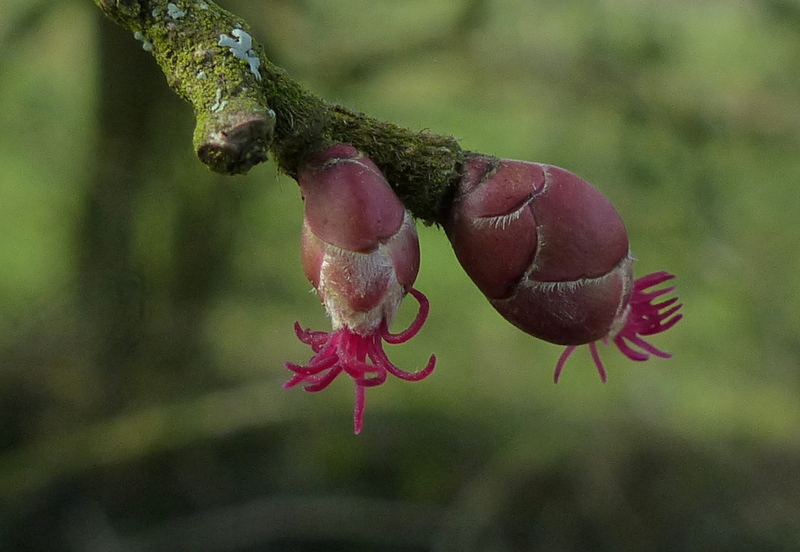 Each female flower has two red styles (The pollen receiving female part of a flower). 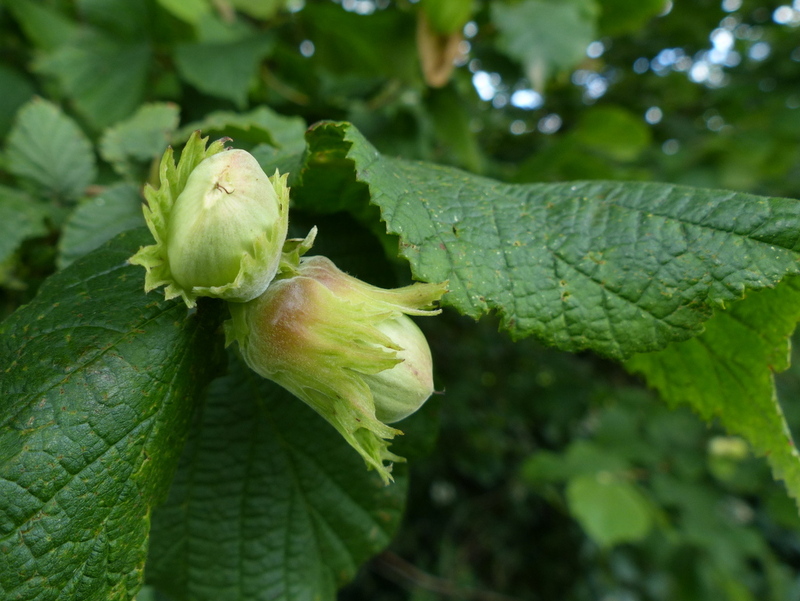 Each bud contains a cluster of between four and fourteen female flowers. 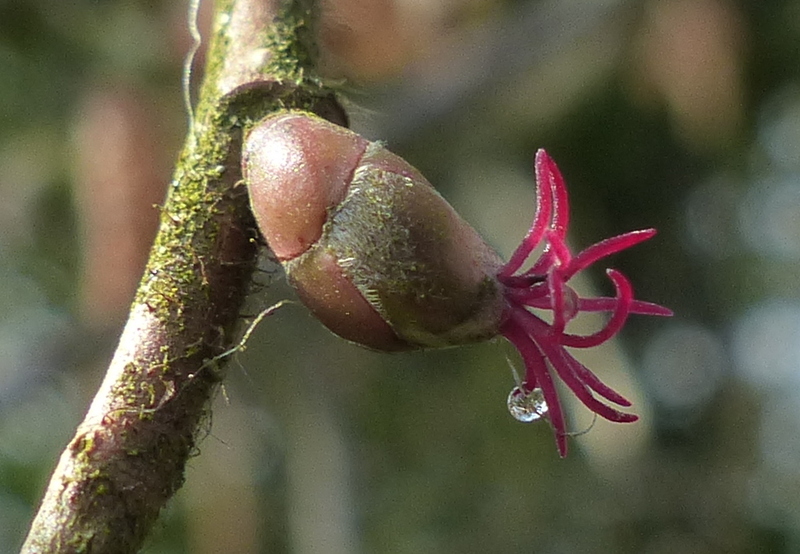 Only the styles emerge from the bud. 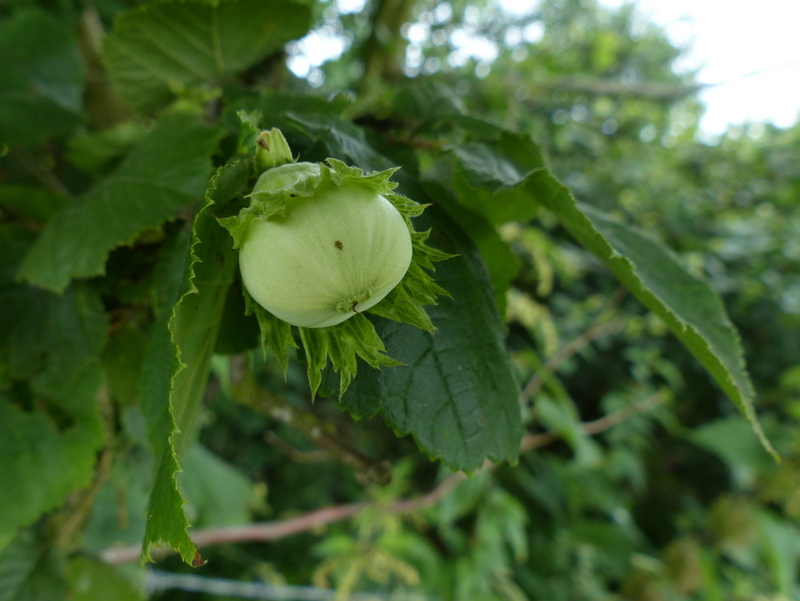 Once pollinated the female flowers produce the fruit. 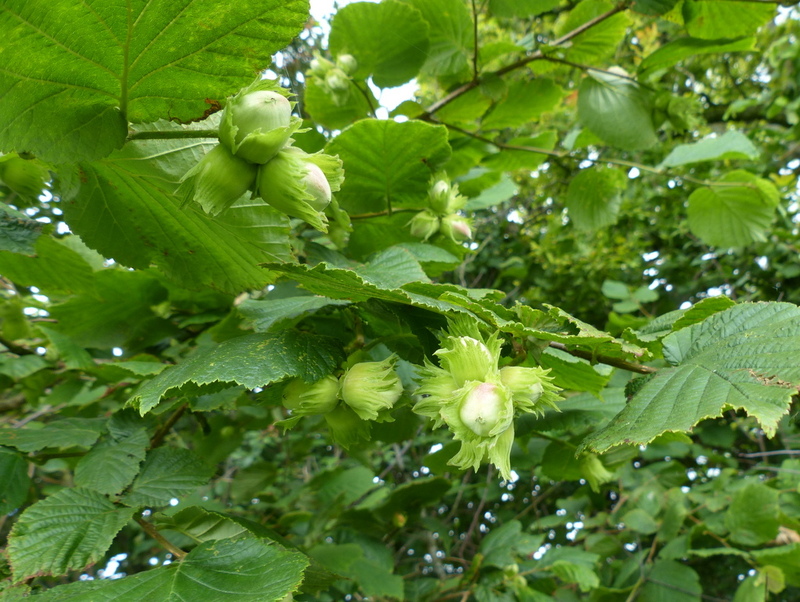 Unripened Hazel nuts are white and appear either singly or in small clusters. 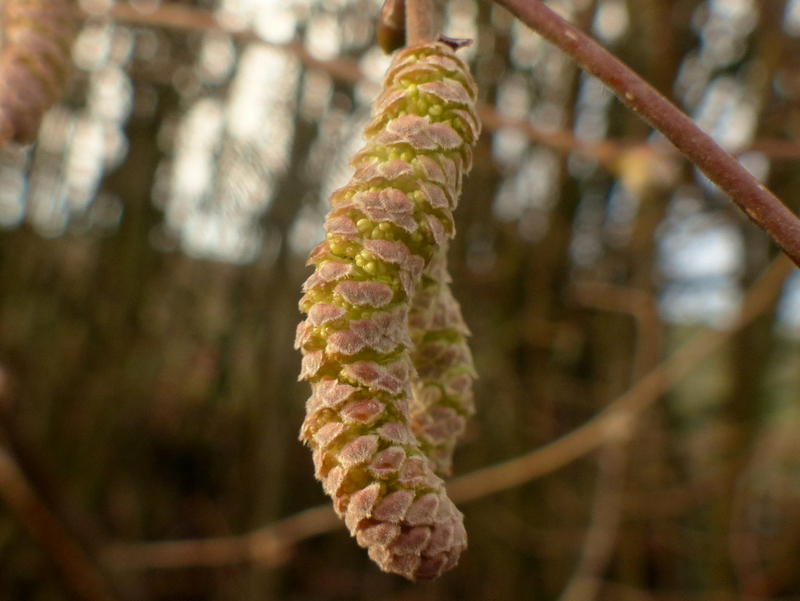 They are surrounded by a leafy, green sheath called an involucre. 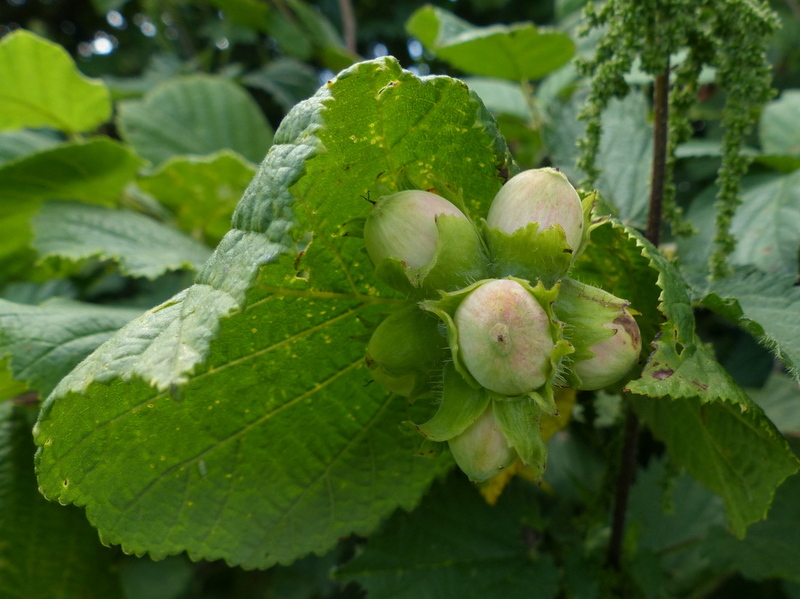 The fruit begins to ripen and turns brown in August. 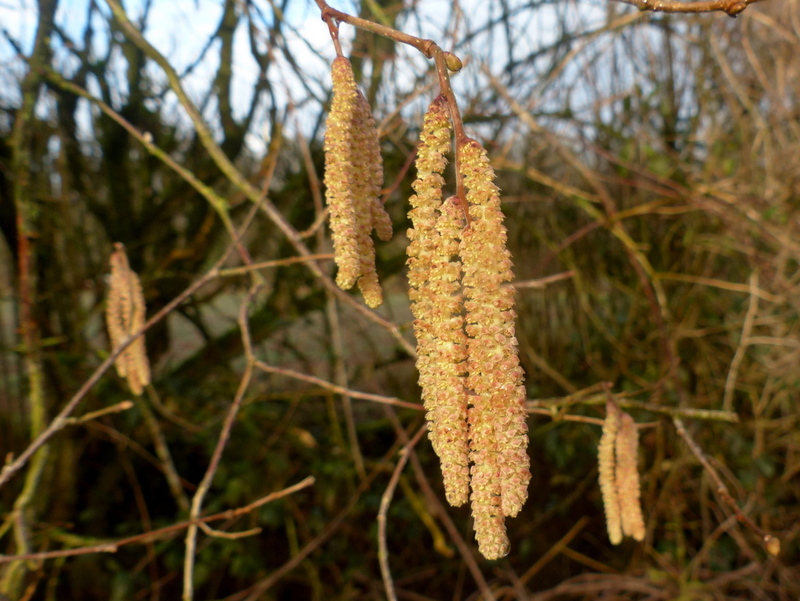 Note that in this next picture, taken on the twentieth of August, next year’s catkins are already growing on the tree. 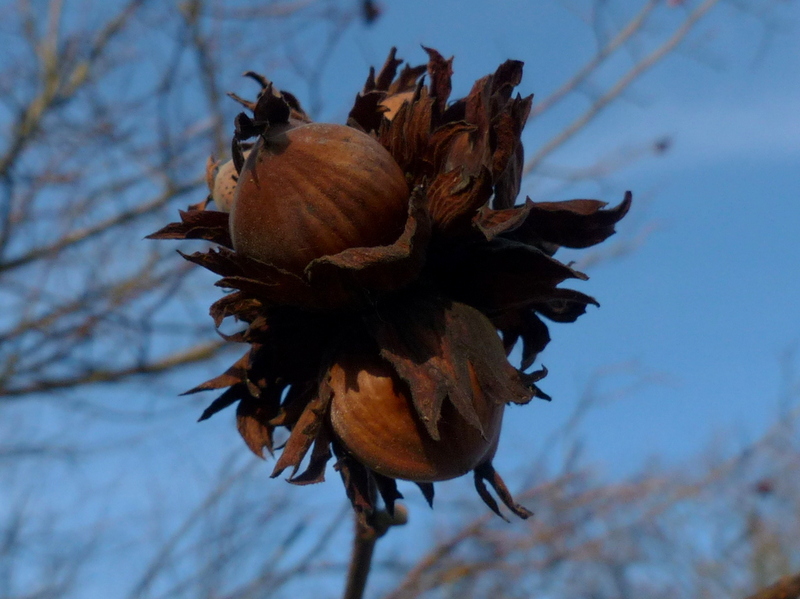 In December a few nuts remain. 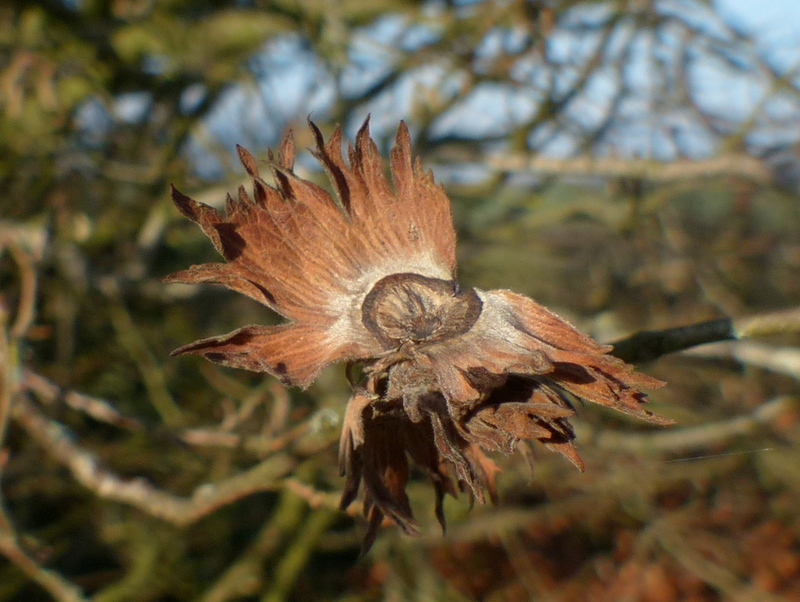 Now the trees are characterised by the dried involucres that stay on the tree long after the nuts have gone. There is a mass of misinformation on the internet. I used the following sources to verify the accuracy of my post. 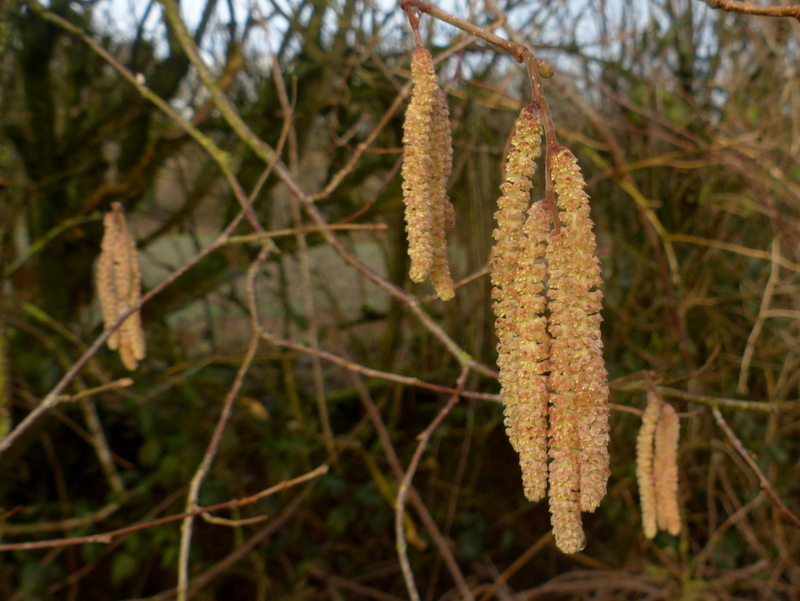 Walked in Clipston in the Wolds yesterday, lots of catkins in evidence. 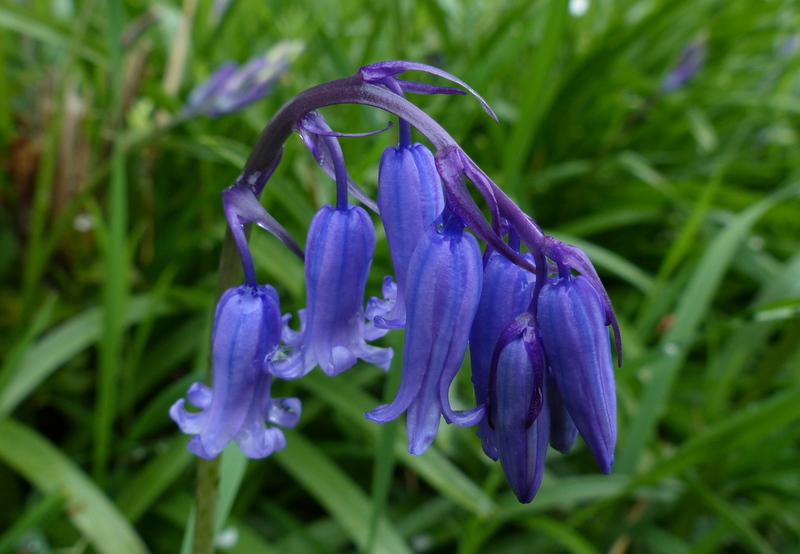 The bluebell leaves were pushing up but ther was so much mud on the track we spent more time looking at our feet. My two boys had a ball in the puddles. If that isn’t the cutest little hailstone reaction ever!! Thank you Barbara 🙂 I think that she practices in front of a mirror before coming out with me 🙂 She knows that I’ve got a camera. We’ve got Primroses here in Wiltshire although I’m not sure how they will have fared after this morning’s frost. Thanks Marc 🙂 Our Primroses are still firmly stuck in the mud. I am intrigued to know how long they can keep from flowering now. 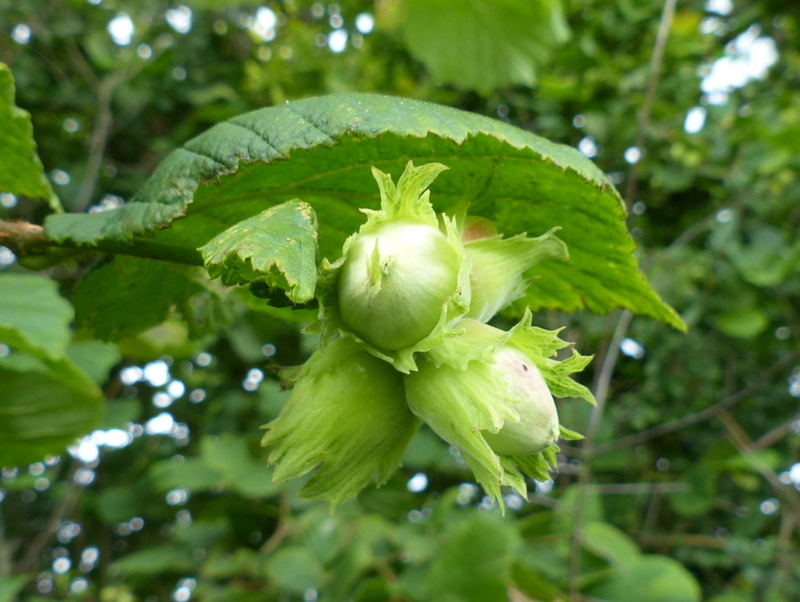 Such an interesting explanation about the Hazel tree. 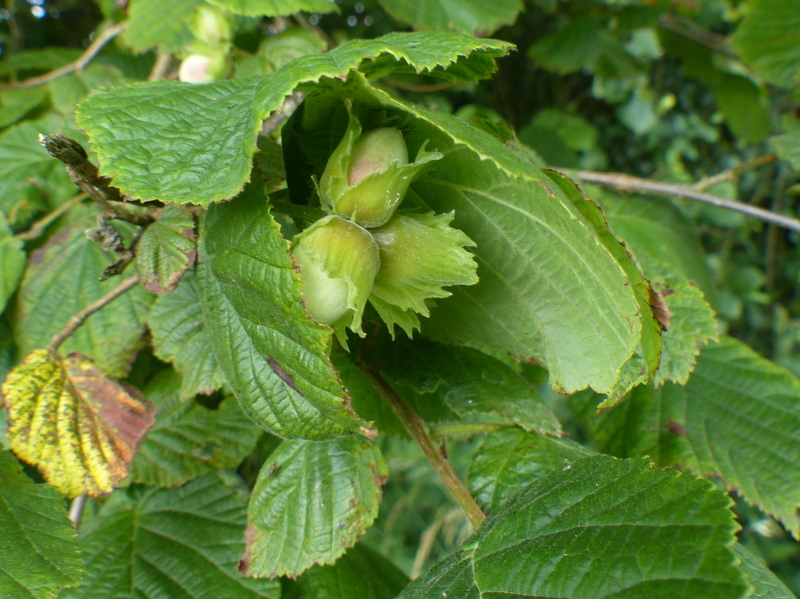 The nuts can be used in so many ways and they are so nutritious and tasty. I’m sure Scruffbag will be beautifully groomed after her beauty parlour visit! 🙂 The pics of the Bullfinches are clear despite the weather. Thanks for sharing, Colin. 🙂 Regards, Iris. 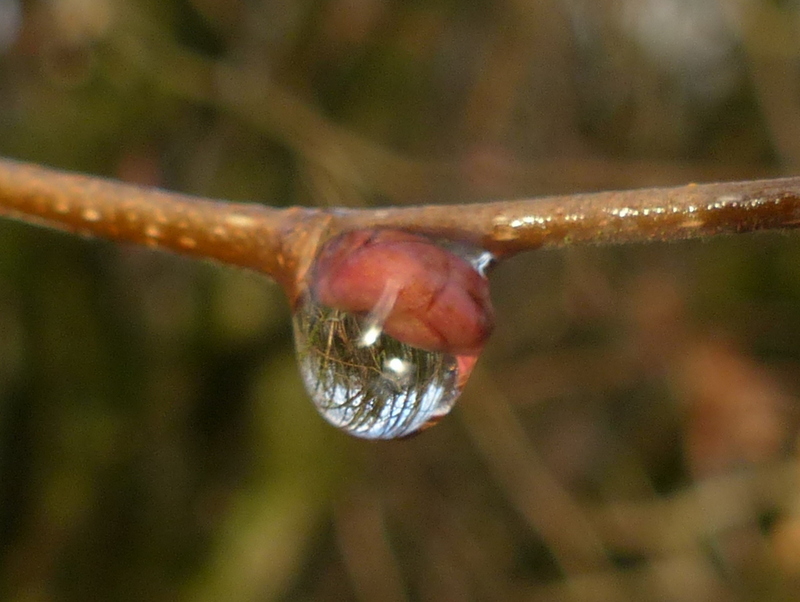 Beautiful photographs and I don’t look at your blog just for Fizz, believe me. LOL Your pictures are so wonderful and you are so informative…love it. Thank you. Thank you Sarasin 🙂 I think there has been a mix up at the beauty parlour and they have brought the wrong dog home. 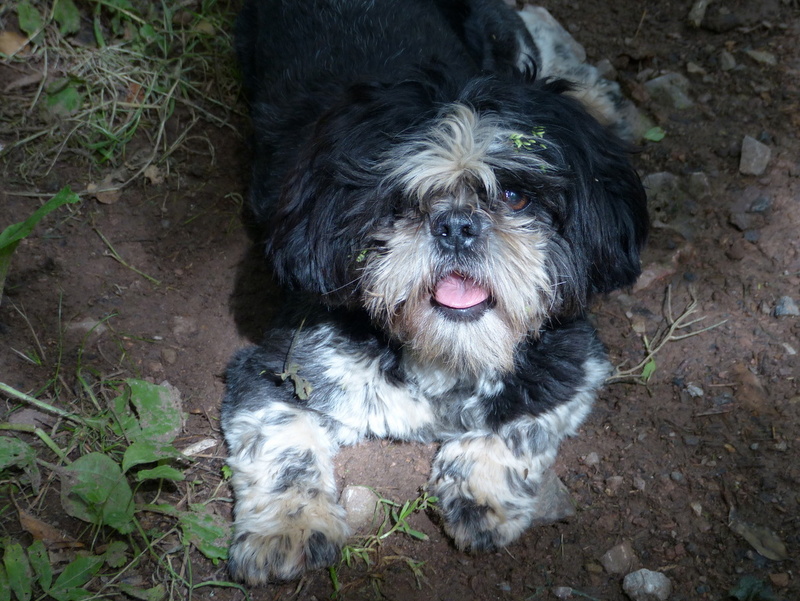 No, that’s that same sweet face, not even to be disguised by hair or mud, lol! I adore Miss Fizz and so do some of the folks here who happen in while I am perusing your Blog.. 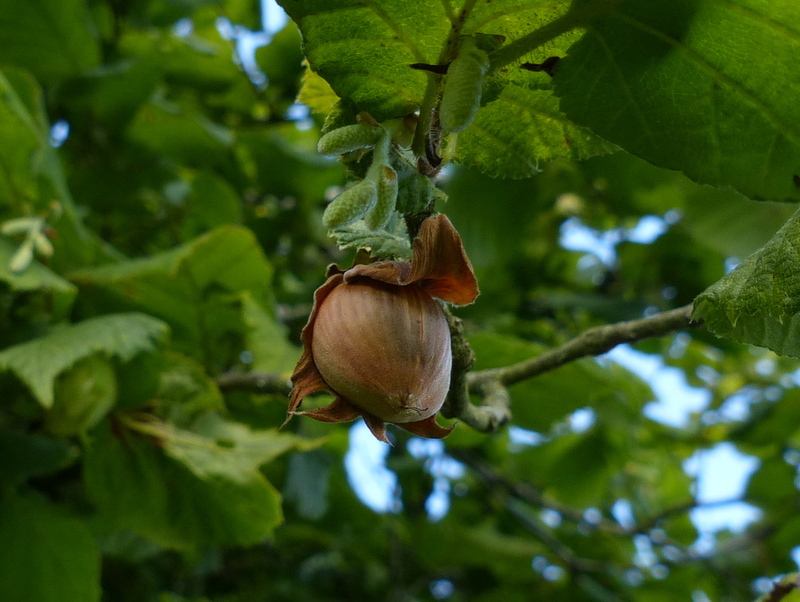 The Bullfinch is lovely and I was so interested in the part on hazelnuts….one of my favorites. I always come away with great information and time, truly, well spent. Kudos to you, Colin. Thank you very much Ettel 🙂 The Bullfinches are lovely and it would be so good if they nested here. I have never seen a Bullfinch chick. I am looking forward to seeing houndling in her beauteous splendour 🙂 And all those birds & flowers – beautiful! As usual, Fizz stole the show! Great post, Colin. You always make it interesting. Happy Trails! 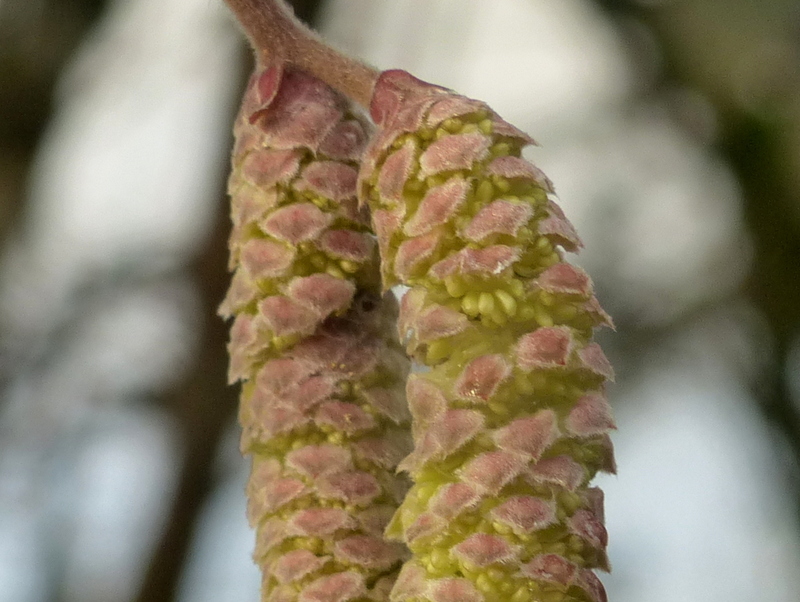 Beautiful catkins. And Hail Fizz! too funny. Great to see the two of you come to life. I’m always thrilled when I see a pair of Bullfinches. It feels like a special undeserved honour. The only when I’ve seen here died flying into our front door, you can imagine my sadness. Thank you Stephen 🙂 I totally agree, it feels like I have received an unexpected present, a gift that I should be really grateful for. Moments like that make the day. I am hoping this pair will stay here. Great post, Colin. 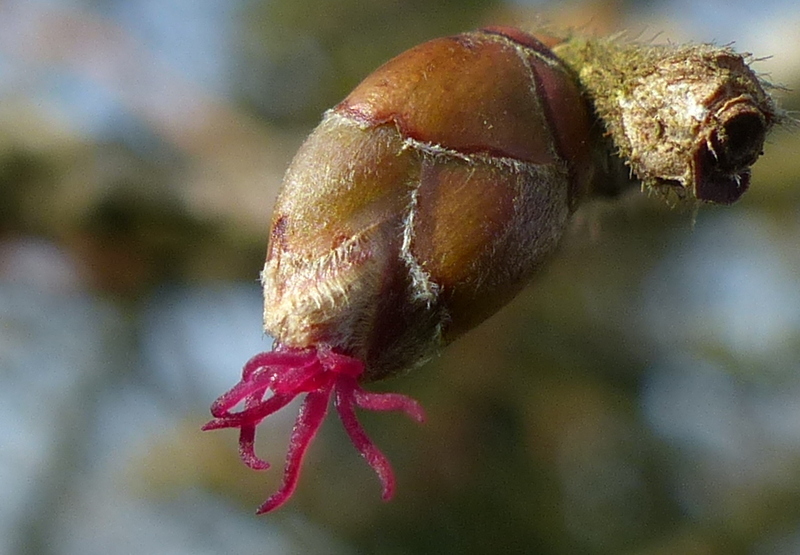 Those close-ups of the female – I mustn’t say flowers! – styles are fantastic! 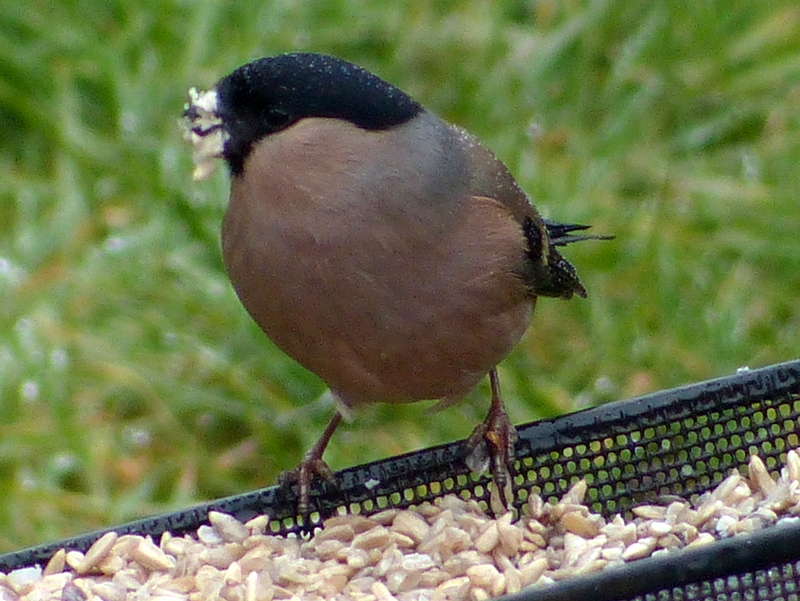 Bullfinch photos are good too. My parents had a border collie who played a similar ball game to Fizz though she just moved her head a fraction instead of walking on. Dogs are so funny! 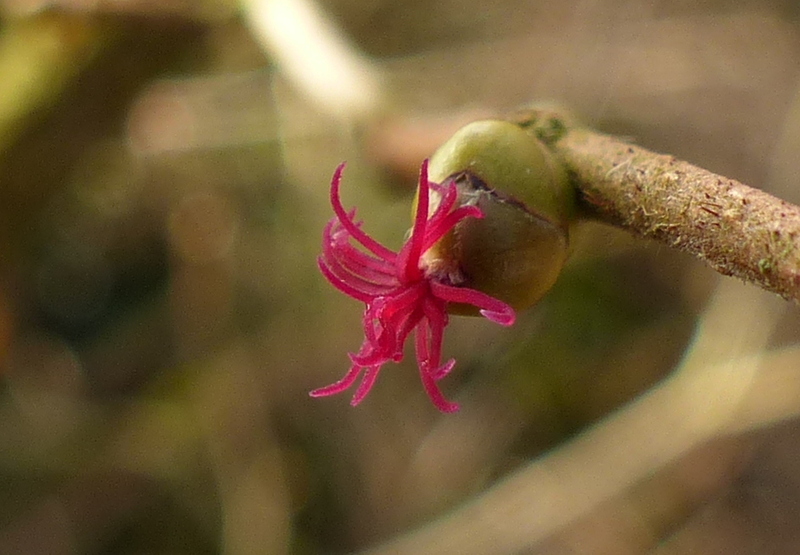 Thank you Clare 🙂 I am really happy to have the flowers on the Hazel, at last I have got something to photograph. I am glad to hear that Fizz isn’t the only manipulative dog around. Manipulative dogs are a joy unlike manipulative humans. 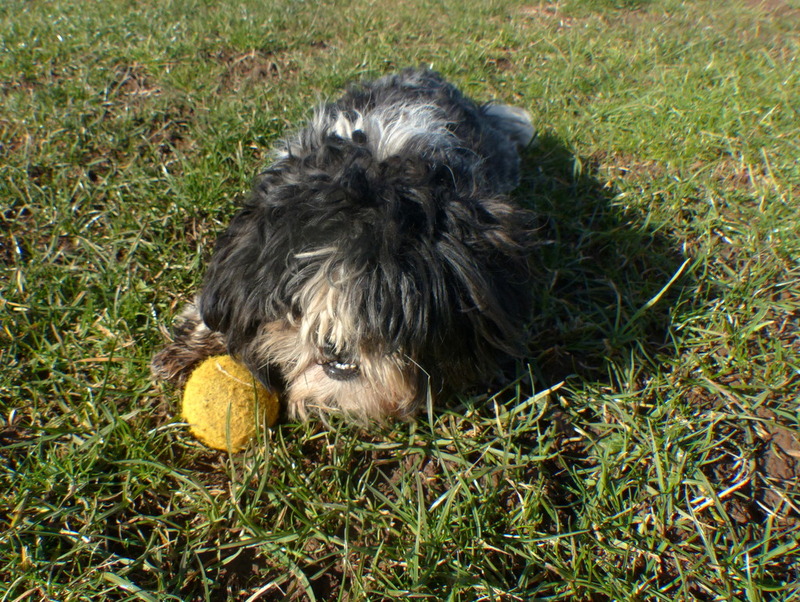 Fizz doesn’t want you to have the ball because you keep throwing it away! 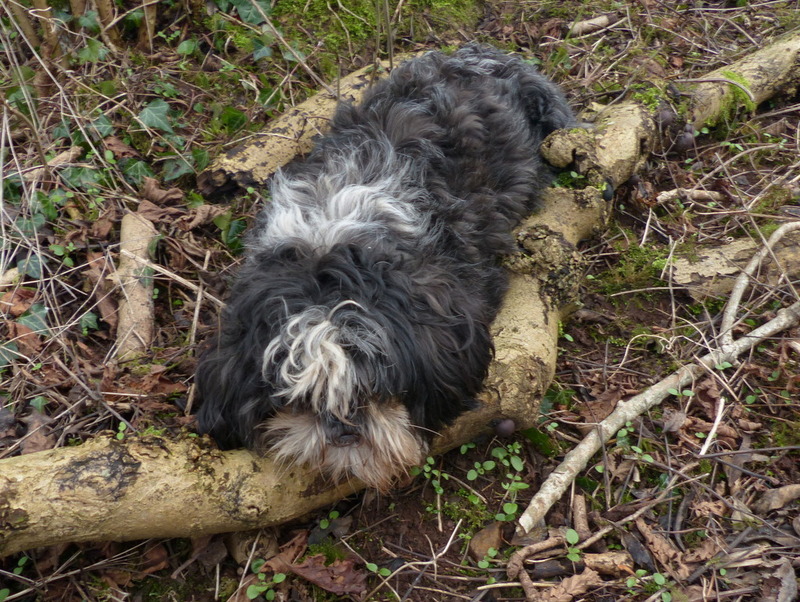 I guess she’ll need a haircut so she can help you spot any wild primroses. Thanks for the pollination info. Fizz certainly knows how to play hard to get…what a sense of humor. 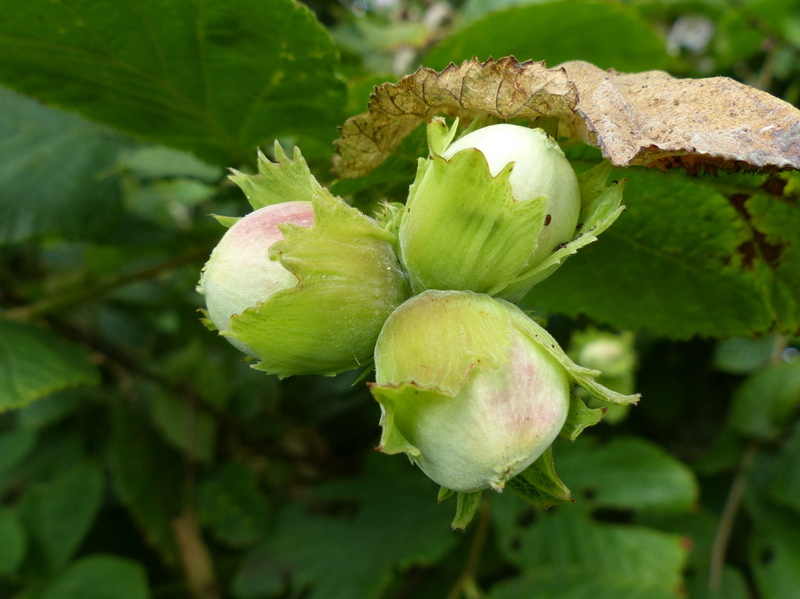 Loved learning about hazelnuts – such a brilliant, tiny flower that grows to such a fat nut! Nature is amazing. Thank you Eliza 🙂 Nature is really amazing. Thank you 🙂 Fizz knows how to run. She is very deliberately teasing me. Thank you Rachel 🙂 Scruffbag is fine but her head is so tiny. Thank you Stephanie 🙂 Her head has got smaller and her feet have got bigger. How does that happen? Fizz has got you well trained! My ancient scruffbag needs some chopping too. She’s also very good at training humans! My previous dogs were large and seemed easier to train than my current furry rat-dog. Congratulations on your progress with feeding your feathered friend. It shouldn’t be too long before it ventures onto your hand. Will it have a Facebook page as well, I wonder. I always enjoy your botanical pictures and information too, even though it’s not something I have a great knowledge of. I spent many happy hours as a child examining different plants, growing my own specimens and picking bunches of “weeds” for decoration.